I have lived in Knoxville for going on 16 years. For the first five of them I lived on campus while attending the University of Tennessee. Then I moved to a condo just one mile away from campus and stayed there ten more years. Where I used to live, there were lots of trees all around and I hardly ever got a great view of the sky. Since moving to our house last summer I feel like we have gotten a new taste of our city. This is kind of funny because we only moved about five miles away. There's a spot where we top a hill as we're driving towards downtown and you can see a wide expanse of the beautiful mountains and the sky. The other morning, my husband and I were headed somewhere pretty early. We came to that spot and were presented with the most beautiful view. The sun was still coming up and the sky was all shades of pink and red and yellow and gold. And I said to my husband, "This must have been what it looked like on Easter morning because all was right with the world again." Easter has significance for me for many different reasons. First, because of my faith....believing that we were once without hope, without a future, and knowing that because of Easter our hope is restored. Our peace with God. Our eternal life. Just knowing that everything is going to be okay. 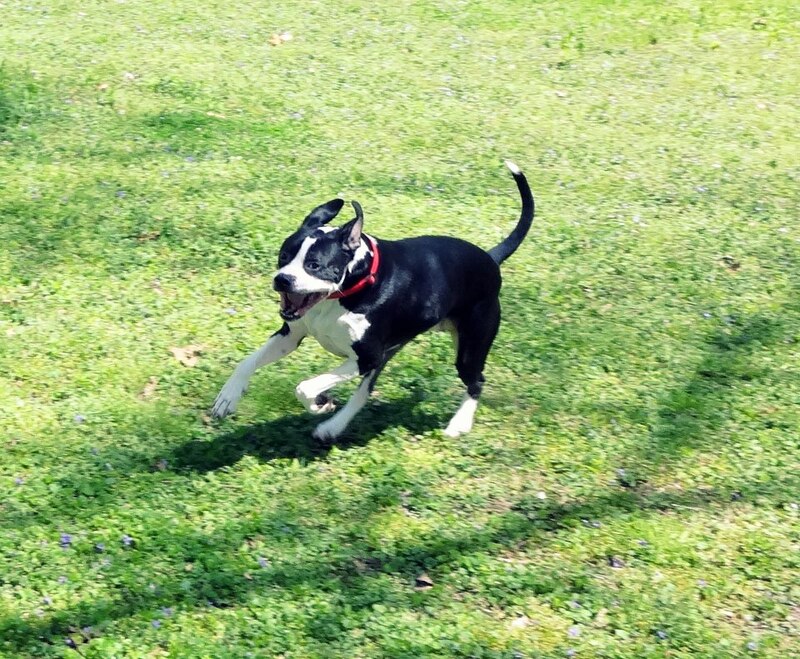 Easter holds other significance for me because it is the day my sweet dog Leon crossed over the Rainbow Bridge. It's really hard to believe that an entire year has passed since he died. I guess I should give you some back story. My husband is very playful and loves to do all sorts of funny voices. Each dog that we have had has been given its own unique voice that was created by my husband based on what he felt its personality was. My Leon had the sweetest personality, and his "voice" matched him perfectly. I am forever grateful to my husband for bringing that to life. If this sounds crazy to you, you are not alone. We have started seeing a marriage counselor and when we shared this with him, I immediately sensed that he might have been writing down "whole new level of crazy." But the thing about it is, crazy or not, we loved our dog. And even though a year has passed, sometimes it doesn't feel any easier that he isn't with us. So on those days, when I'm missing him really bad, it helps that my husband can still bring his voice to life. Okay, so here's where we take things to the next generation level of crazy...in our minds, Leon is in heaven. With Jesus. And we imagine them having all sorts of adventures. Like playing Scrabble, visiting Saturn, and eating pizza together. And in our little wacky world, my husband even does a voice for Jesus that sounds very much like Hank from King of the Hill. But here's the thing...I thought doing this would help me feel more peace about Leon. But instead, it has helped me feel more peace about Jesus. Not that I ever didn't feel peace about Him, but growing up, seeing him as that long-haired, bearded guy in a robe on the Sunday school lesson, Jesus always seemed like this stranger that I didn't really know. Picturing him traipsing around heaven with our dog in tow has made him real to me in a new way. Recently, I thanked my husband for making up this little fantasy because of how it had helped me deal with my grief. He said that it wasn't just a fantasy to him...that he really did believe Leon was with Jesus. And all our other friends and loved ones who have gone on before us. Heaven is a real place. It's not just something we've created to make ourselves feel better. I know it's real and I know my loved ones are there. And because of Easter, I can one day see them again. Even though faith is something many of us share, it's also very personal. When I was young, I had a book called "Little Talks Between God & You." It made it seem so easy to talk to God, and now, three decades later, I still see him as someone I can have little talks with. I don't want God and Jesus to be something I only "experience" in a church building. And I hope you don't think you have to go to a church building to experience them. Sunday, we will celebrate Easter with family at church. And I'm sure I'll be sad because it will mark the anniversary of my boy's passing. But if my husband really believes we'll see him again, playing his trumpet in heaven, I can believe it too. 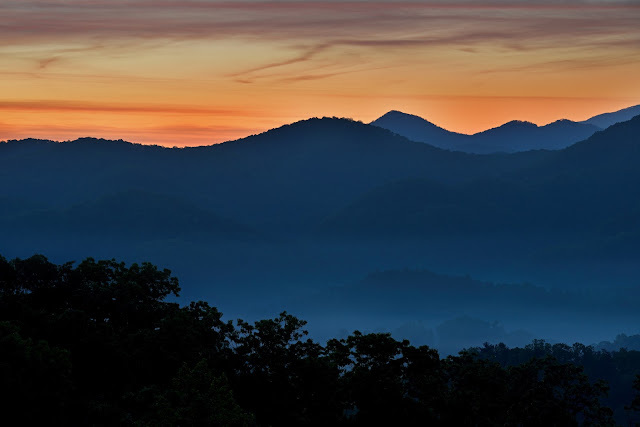 Easter is nearly here and spring is bursting forth in East Tennessee. There's a tree next to my driveway that has looked dead or dying since we moved in last summer. And I'm happy to report that its boughs are now covered with pink blossoms. That's the thing about springtime...sometimes new life pops up in places you least expect it. Are you hosting your family or friends for Easter this year? Whether you are setting the table for a large group or just yourself, this special season is certainly worth celebrating. 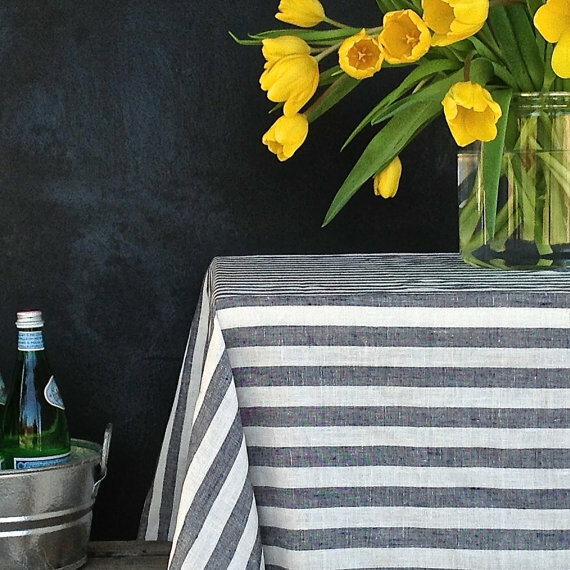 Just like a gorgeous painted canvas creates the setting for a play, so does a table cloth create a place for the story of your table to unfold. It's spring and I love color, so I'm opting for a bright blue cotton table cloth to set a dramatic scene for my Easter table. My table cloth, a wedding gift, was woven on a floor loom by a family of weavers in a textile shop in Mexico. You can find a similar one from the same region available to purchase here. I was also inspired by this gorgeous striped linen option (pictured), which is available to buy on Etsy. When I was growing up, my mom had a set of place mats that we always used for family dinners. They weren't anything fancy, but the act of setting the table with them was a ritual that I came to be very familiar with. We hardly ever used a table cloth for daily meals, but we always used the place mats. There was something about the way they made our plain wooden table seem more dressed up. Place mats are a great addition to your Easter table, but don't worry if you don't have a huge collection. If you have several sets of four, mix and match them to create visual interest. I try to collect place mats in similar tones and shades so they all work together. Maybe you have some round and some rectangular. Setting a table with mats of different shapes can look really great whether they are monochromatic or complimentary shades. I love dishes of all kinds. 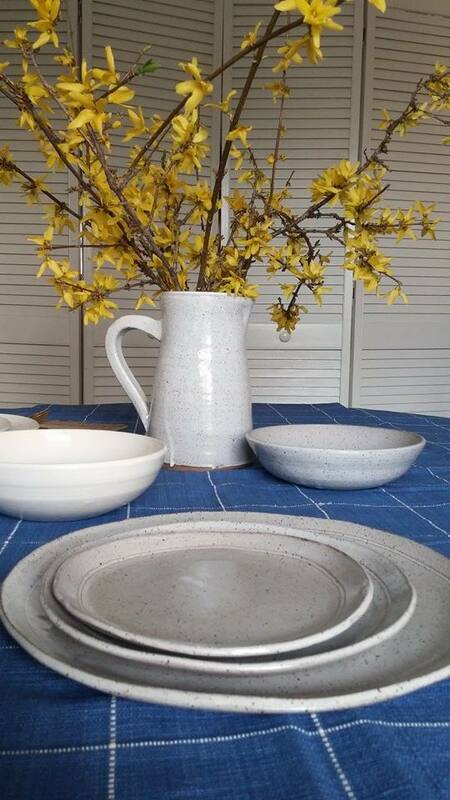 For several years I collected vintage Johnson Brothers ironstone in a floral pattern (Staffordshire bouquet), but eventually I decided that I'd rather have simple, white dishes. That's why I opted for Wedgwood Intaglio as my wedding china, which we use everyday. When I connected with Leanne McQueen of Maryville, Tennessee-based McQueen Pottery, I fell in love with her simple, yet elegant creations. Her hand formed pieces have a rustic elegance that lends itself to everything from a formal seated dinner to a casual family brunch. 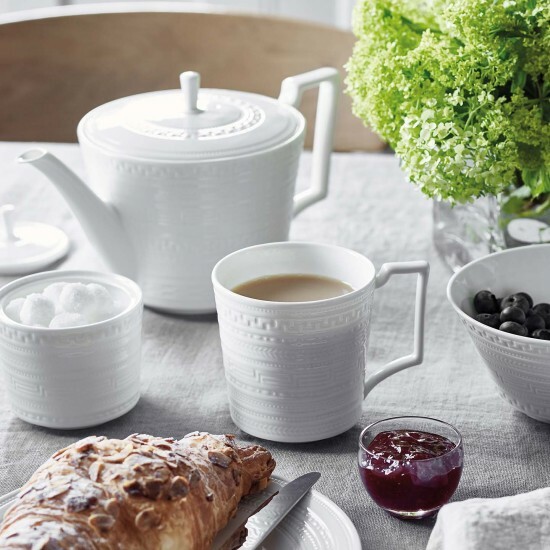 McQueen Pottery comes in a wide variety of styles, including bowls, cups, plates and platters as well as pitchers and vases. It is available in two colors, milk white and speckled, a shade that is reminiscent of dove gray. There's something about a handmade object that makes you appreciate it even more and these pieces would make a lovely addition to any Easter table. There's also a bridal registry option for those brides-to-be. Stay tuned for an upcoming interview with Leanne McQueen for more of her story! Accessorize - with napkins, flatware & flowers! Napkins are a great way to accessorize your table. I have started collecting vintage napkin rings as I run across them because they can really go a long way toward making a statement with your place settings. 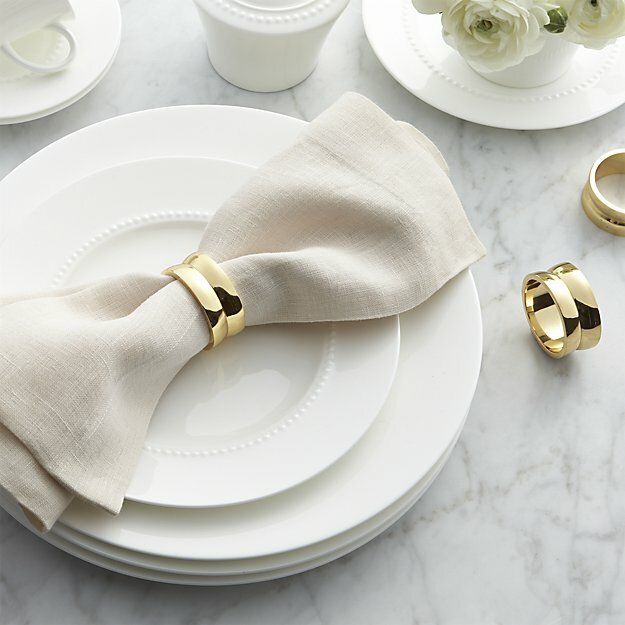 This blog has a great round-up of different ideas for napkin rings if you want to DIY. Plus, it has some good examples of how to fold your napkins. Flatware is another great way to accessorize your table. When I spotted a 10-piece place setting of gold flatware at a second hand shop, I knew I wanted to add it to my collection. Whether your flatware is old or new, gold or silver, it can give your table a more complete look. 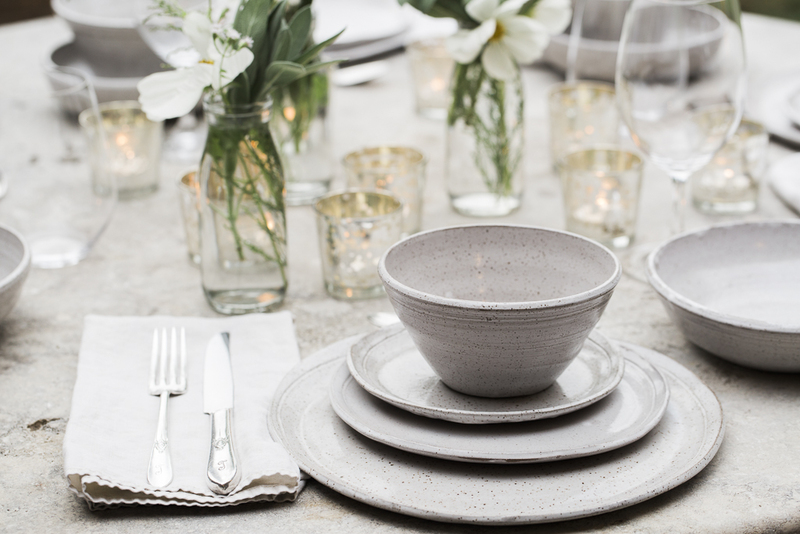 Need tips for setting your table? Emily Post knows best! Remember "FOKS" (pronounced like fox) for the order things go in (from Left to Right - Fork, O the shape of the plate, Knife w/ blade turned toward plate, Spoon). For flowers, I decided to go with some freshly cut forsythia branches. 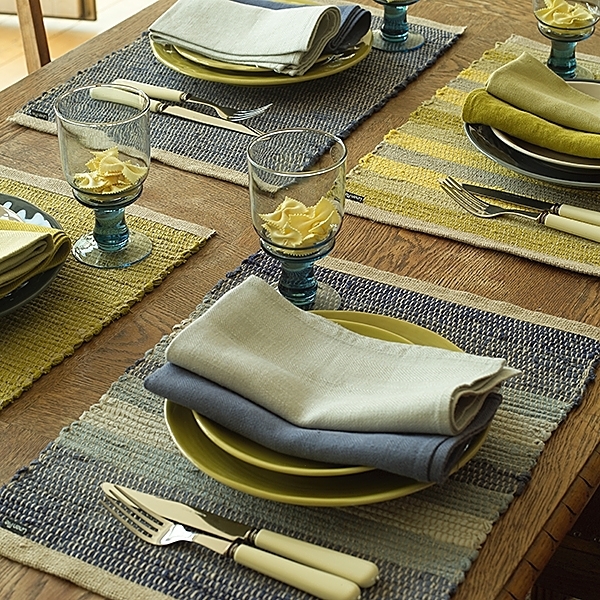 The pop of yellow is nice against the blue of my table cloth and this is a lovely way to bring nature into the house. I've always loved the look of a wild, sprawling arrangement of flowers as opposed to a perfect bouquet. These are just a few things you might want to incorporate into your Easter table! Whatever you do, keep in mind that the folks around the table are what matter most. Even if you are just cooking a delicious meal for yourself! Muscle memory is a very real thing. It happens when you do something over and over again until it becomes committed to your recollection and eventually you don't have to think about it anymore. Like typing or riding a bike. But what if muscle memory is not limited just to our ligaments and sinews? And what if it's not limited just to ourselves? Sometimes when I'm at yoga class, and my body is folded into one pose or another, I feel this strange sense of deja vu. Like I'm part of something that's much bigger than me, and I've been part of it for longer than I realize. Going through the movements and motions, I wonder about all the people who have moved their bodies into those same poses before. Maybe it seems strange, but I feel connected to them. This feeling of connection is what made me start to wonder about muscle memory in the first place. I've often thought about my ancestors, not just my grandparents, and great-grandparents and people I've actually known, but the ones who came before...way, way back. Each generation brought forth the next, and as they were, so came the rest of us. Strong men and women whose bodies brought forth new lives, and so on. And what if maybe somewhere in all of that, the memories and movements of each generation were passed to the next? Now I highly doubt that my Freewill Baptist preacher's wife of a grandma ever even heard the word yoga, let alone did downward facing dog. She who never cut her hair or donned a pair of slacks in her life (only dresses) would have considered it some sort of devil's magic. But I feel certain she stretched and moved, and worked as she plowed her garden. And tended to her family. And everything she did was a part of her, all the way down to her muscle memories. And so, because of her, those things are a part of me. Even if I haven't experienced them, or haven't witnessed them in many years. Like holding a wide metal bowl between your knees while sitting in a cane-bottom chair that is especially low to the floor. And the continuous motion of snapping off the ends of white half-runner beans, pulling the strings away and pushing them into a clump to one side, while tossing the beans themselves into the main pile. Or ringing the necks of chickens, two at a time, one in each hand. It's like the memory that washes over you when you encounter the words of a poem you've never read before, but somehow feel that you've known it all along. That the emotions and sentiments they embody could just as easily be your own, evidenced by the way in which they move you. Like a mother must feel to look out into a crowd and pick out her own one child from hundreds of others. There's a comfort in knowing that something or someone is of you, is from you, is for you, is about you. It must have a little bit to do with time, or the absence of it, in heaven. At least the absence of it in a linear sense, like what we earth dwellers are able to understand. I suppose in God's eyes, everything that ever will happen has already happened. He already knows how it all ends. So there are no surprises. And maybe that's why the words of poet Mary Oliver ring true to me, as if they could have been my own words. If I'd had the courage to write them. Or the inspiration. It's not just that I love her words, I feel deeply connected with them. Do you have a writer you makes you feel like that? Whose words evoke a strange longing in you, a muscle memory that doesn't quite make sense? I'm no scientist so I don't really understand where nurture stops and nature begins. Some things about us are so because we saw our parents or grandparents do those things, and we learned to do them too. And other things are so because those things were inside our parents and grandparents, whose own parents and grandparents passed them along. There's a particular way my mom uses her hands when telling a story. And sometimes, I catch myself doing it too. These are motions we didn't even realize were within us, and yet there they are. That's the beauty of being human....there's a lot more beneath the surface left to be discovered. And there's so much inside us that we rarely tap into. We're never alone in this world, no matter if it sometimes feels that way. Whether you knew them or not, there were people who came before you. People who struggled and overcame things we'll never understand. We may not know their stories in the same way we know our own, and we may not be able to fully understand the challenges they faced or why they made one decision or another, but all that they were is in us. Part of our muscle memory. And knowing that makes it a little bit easier to face what life serves up. 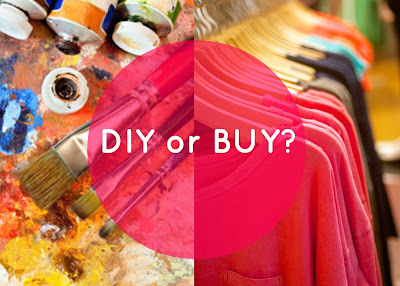 This is a new series I'm starting on the blog, called DIY or BUY. We've all been there, scrolling on Facebook or Pinterest and we see some fabulous DIY project tutorial that seems too good to be true. The latest DIY tutorial craze is videos, as you've surely seen all over the web. The anonymous crafter (shown only by their hands, am I right?) makes each project look so easy, each resulting creation is perfection. But we know this isn't always the case. 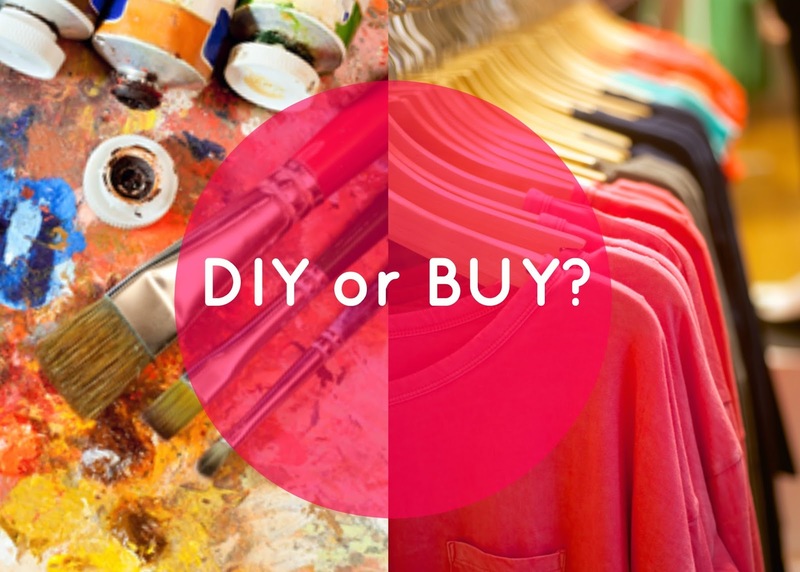 So, I've decided to try out a few of these projects myself and report back to you whether you should DIY or save time and buy a ready made version instead. 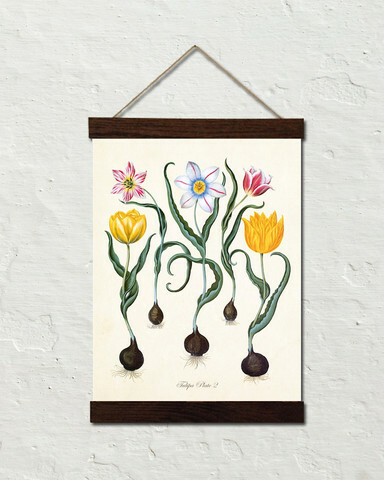 This edition of DIY or BUY features some fun spring art projects for your home. Two of them I saw as Skillshare videos and the third was a project featured on a popular DIY blog. 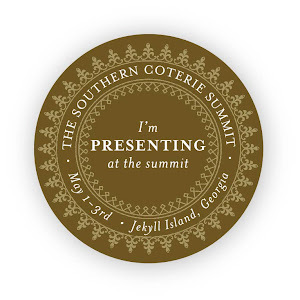 I was inspired to make this project after seeing some gorgeous versions of a similar type in a great Washington, D.C. boutique called Salt & Sundry. I can't remember how much theirs were being sold for, but the comparable version I found online is $50. My version is about $12. To make your own wall art with wooden hanging slats, you'll need 4 wooden slats. I found several varieties pre-cut and pre-packaged at Hobby Lobby. 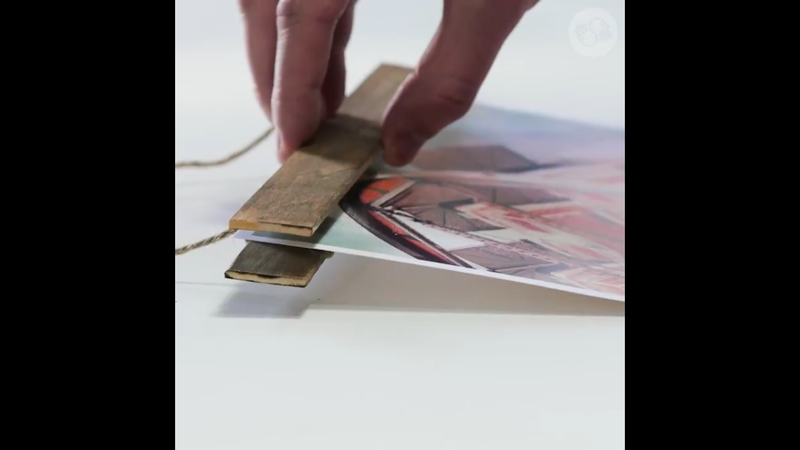 You could also use vintage rulers (I'm doing that next as soon as I find some). If your wood is raw, stain or paint it to your liking. Additional supplies are magnets and twine. Then of course you'll need your artwork. 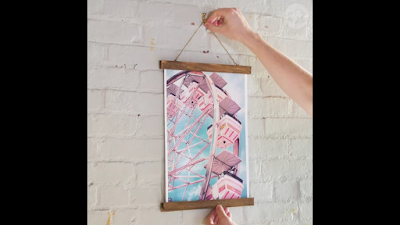 Attach the magnets to the wooden slats and add your twine for hanging it up. The video pretty much shows you how this is done. And it was basically as easy as it looks. If you want to skip the magnets, you could affix your art to the slats with staples and in that case, you might only need two slats. 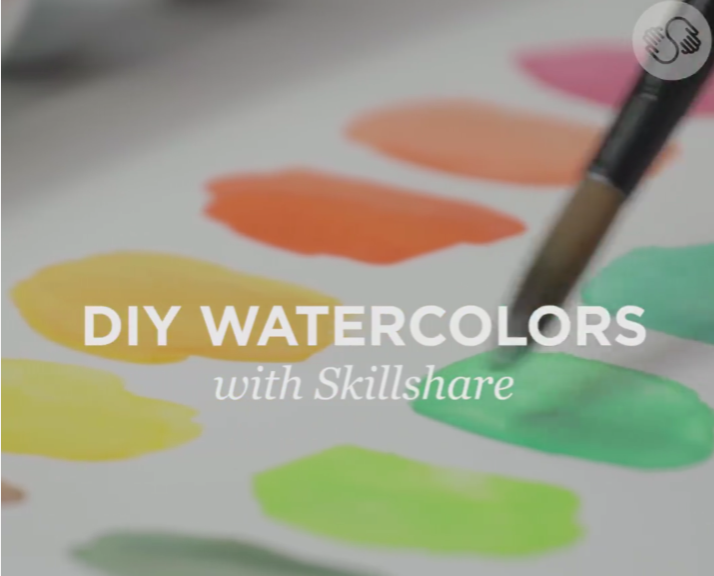 This project grabbed my attention from the start, because I love watercolors. My first set was given to me by my aunt and uncle, who as artists themselves encouraged me in all artistic pursuits. I so wanted this project to work. 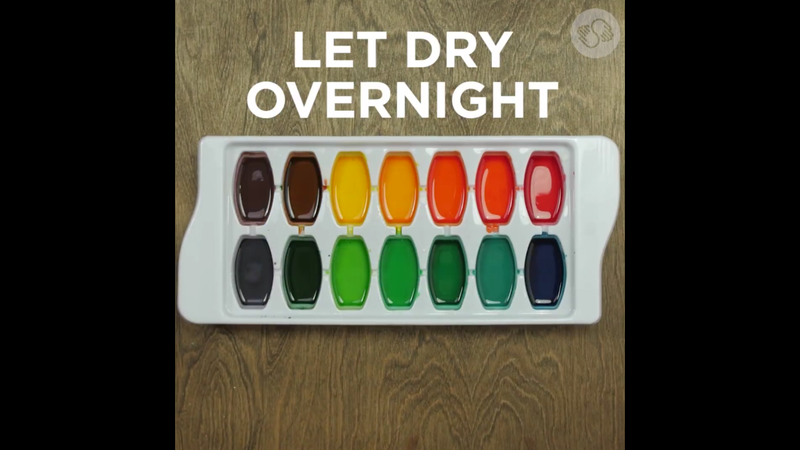 Using just household ingredients and a plastic ice cube tray, you are supposed to be able to create your own paints. Maybe I didn't measure the liquid quite right or it's possible that I didn't stir enough, but my paint never solidified. This was a disappointment for me. If you had plenty of time to wait and see if the paint would solidify, this might not be so bad. But since I wanted to use the paints to create something, it didn't work out for me after several days of drying. And the instructions only said to let paint dry overnight. This was the easiest of my three DIY or BUY spring art projects. 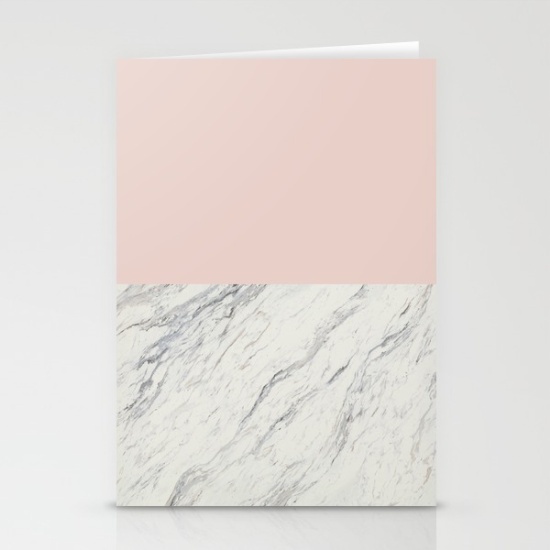 I've always loved stationery and saw a tutorial for a DIY marbled version. To make it, you'll need a can of shaving cream, food coloring in desired color, and blank cards and/or envelopes. Squirt some shaving cream into a shallow baking dish. 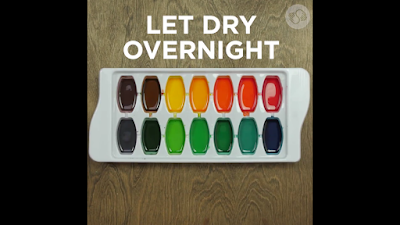 Add a few drops of various shades of food coloring and swirl it around with a toothpick. Apply paper to the surface of the shaving cream so that the entire side of the paper is touching. Pull it up and use something with a straight-edge to swipe the shaving cream away. For photos of each step, click here. I love the way it turned out. 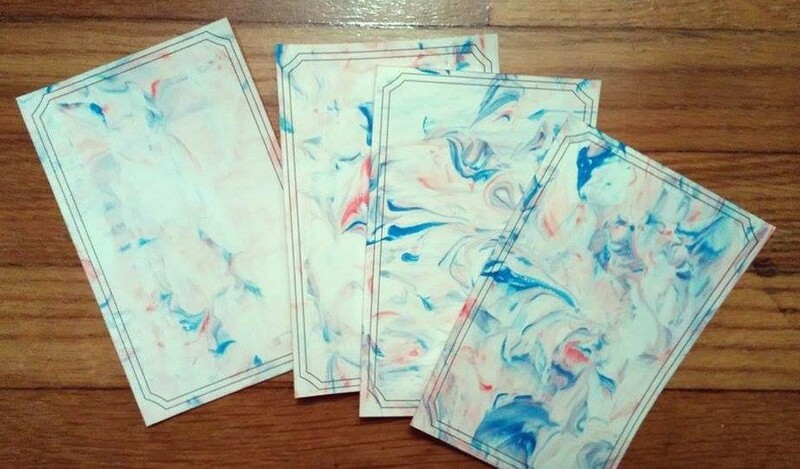 I already had the paper and food coloring, so this project cost me a whopping $1 for a can of shaving cream from Dollar General. For a ready-made version, check out the cards below. They are 3 for $12 and can be purchased here. Every DIY isn't going to be a success. Sometimes failures happen. But it's fun to try and it always gives me a new feeling of creative energy when I try a project for the first time. I've had plenty of fails over the years. From small things like burning dinner or having a fender bender to larger things like finding myself estranged from a dear friend or losing a job. No matter what happens to us, life brings its valuable lessons. I hope I end up wiser for it! When I was growing up, my parents didn't let me drink coffee. My grandparents would allow me to have a cup when I visited their house, although it was probably mostly cream. I remember feeling so grown up while sipping from my piping hot mug. As a teenager growing up in my small southern hometown, going to the coffee shop was a huge rite of passage. We had one coffee shop called the Magic Bean that was frequented by older teens and college kids. Of course, my parents forbid me to go there. So it wasn't until a more family-friendly coffee shop called Poet's opened up that I was able to experience the magic of coffee house coffee. It wasn't until after I married my husband that I started drinking coffee every day. I always enjoyed the taste of it, but never got the process of brewing it quite down pat. Since I now have someone who makes it very well, I drink at least a cup or two each morning. I love to entertain, but am always looking for unique ways to do it. And this is what got me thinking about how fun it would be to throw a DIY coffee party. It could be in conjunction with a book club meeting or other gathering, or you could just do a coffee party for coffee's sake. Either way, it's a simple and fun way to get together with friends and enjoy something we all love. To throw your own coffee shop party at home, you'll need coffee and coffee accouterments. First, you might want to decide if you are going to serve hot or iced coffee drinks. Serving iced coffee might be easier since you can make more coffee ahead of time. 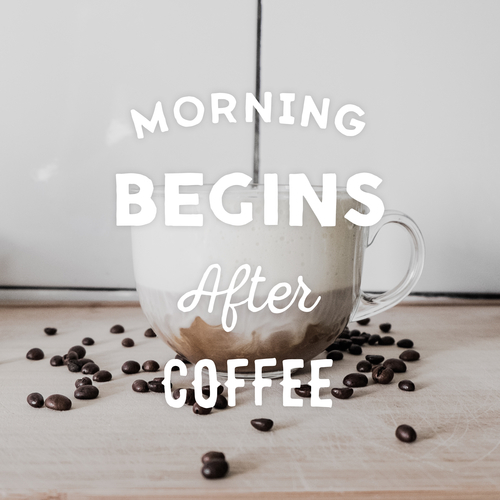 Otherwise, you might be limited to one pot of coffee at a time. Unless you have a big industrial coffee brewing set-up, and then we're all coming to your house. Whether you like French press or drip, or even cold brew, you can host a coffee party that suits your taste. 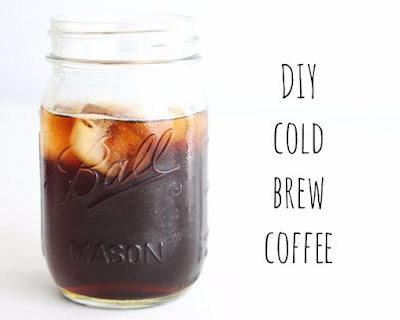 If you haven't tried cold brew, here's a great recipe. Once you've decided what coffee mix-ins you want to include, just set them up in a self-serve station so your guests can help themselves. Then let everyone go to town mixing and making all sorts of delicious creations. It might help if you provide some recipe inspiration, or make suggestions about different combinations to try. For inspiration, check out these 17 different coffee shop drinks you make at home. 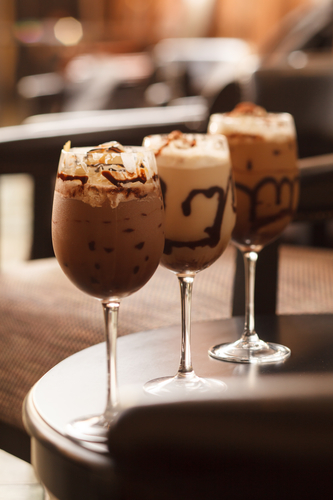 One of my favorite coffee drinks is an authentic Italian treat, the Shakerato. I first heard of this delicious concoction while reading a magazine interview of Donatella Versace. She referenced it and said this was her favorite summer drink. I was intrigued and tried to recreate it based on her description, but finally found a great recipe online. Put all ingredients into a cocktail shaker (or as I've used in a pinch, a Nalgene water bottle or some other jar with a secure lid). Shake it all up til you get some good foam. Pour into a stemmed glass and enjoy! 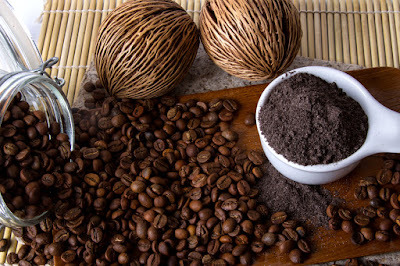 For a great favor to give your coffee party guests, why not give them each a small jar of homemade coffee scrub? It's simple to make and has 4 basic, all natural ingredients. 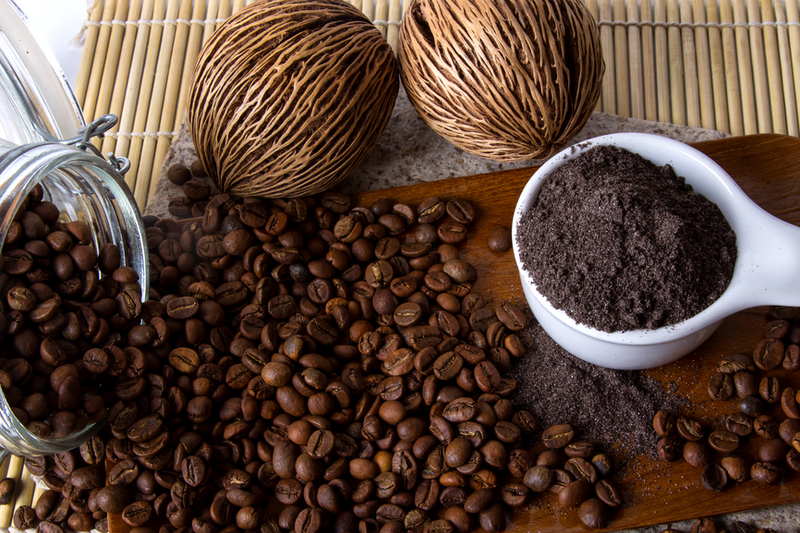 I've tried making a coffee scrub before, but this one is even easier than the recipe I used previously. It only requires 4 simple, natural ingredients. I love it when I can make something that doesn't contain a bunch of stuff I can't pronounce. Each of these ingredients has great healing properties....from the antioxidants in coffee that fight free radicals to the mineral rich coconut oil, which soothes and moisturizes. Coconut sugar is grainier than granulated sugar, but you could use any sugar you like or happen to have on hand. Sugar in the Raw is another good option, although it might be too coarse if you want to use this scrub on your face. Did you know cinnamon has bacteria-fighting properties? Mix the dry ingredients together and then slowly incorporate the coconut oil. If the oil is in a liquid state, you run the risk of your sugar dissolving in it. You can also add more or less oil depending on your skin type.